Turn your drone into a pizza delivery aircraft with this payload release mechanism. We joke about pizzas because it seems to be an obsession of the News Channels, but aside from pizzas there are lots of other uses. For example, with it you could build an emergency response drone to deliver life buoys to struggling swimmers, or in sport fishermen are using drones to drop bait just where they need it. The device itself is very simple. It uses a sliding pin mechanism, driven by a high quality metal-geared servo to cover and open a slot, which the hanging of a payload can be passed through. What temperature range is this mechanism rated for? Sorry, we have no temp rating for this device. how exactly is the device remote control? Does it have anything to do with Arduinos? If so can anyone suggest a cheap one that will work with this model? To control the mechanism, you need a remote control and receiver. For example the FlySky i6 set - here. What is the maximum distance that the mechanism can work up to? I assume you are talking about the control distance? That would be limited by your radio control gear, for most systems that's about 1km. Could of questions for you please? Is this servo compatible to be powered by a DJI Matrice 210 from the rear port and secondly, could the servo be remotely controlled by either of the controllers that comes with the Matrice...either a DJI Cendence remote controller or the secondary control which is a Insipre 2 remote controller? 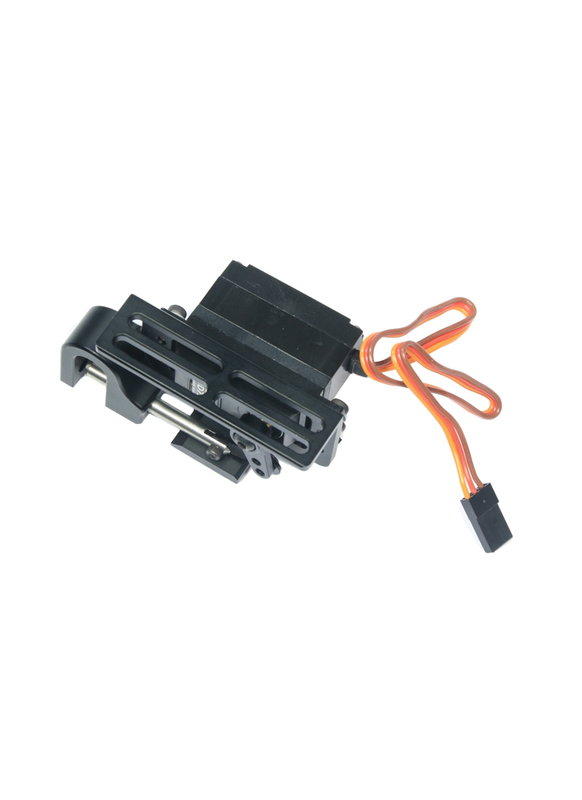 We don't sell the DJI Matrice so we can't say for sure, however I don't believe the Matrice has a PWM servo output which you would need to control this device, so in short, no I don't think it would be compatible. Will it work with Splash Drone 3 Auto? Sorry, we don't sell that drone so can't tell you for sure. However, it will work if the drone has a PWM servo output.